In most of the villages it is common to see residents engaged in digging pits, carrying bricks or cement or supervising toilet construction. As many as 230,000 individual household toilets have been constructed in the district so far since the initiation of SBM (rural). “In our village only half of the villagers have toilets in their household. People barely meet the essentialities of normal living. Building a toilet is a kind of luxury for most villagers. Toilet construction is only in their wishlist, which will not happen without external support. The local administration came forward with financial help and the response from the villagers is receptive,” says Fatima, sarpanch of Khorhansha gram panchayat of Jhanjhari block. 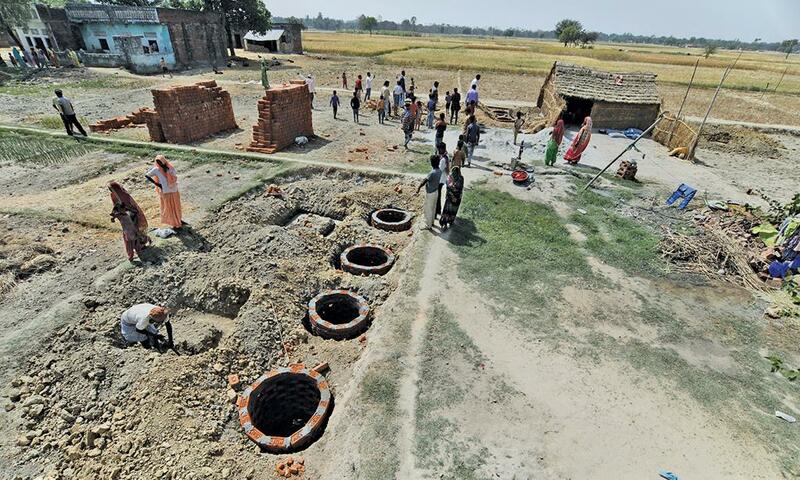 Prior to the massive drive, the household toilet coverage in Gonda was just below 40 per cent and it climbed to 46 per cent in just one week of the recent construction phase. Gonda district has always been a back bencher in terms of sanitation. According to the 2011 Census, the district showed that 91 per cent of the rural population, which contributes 70 per cent of the population in the district, opted for open defecation. After the launch of SBM in 2014-15, the rate of toilet construction in the district picked up and around three times more toilets were constructed. 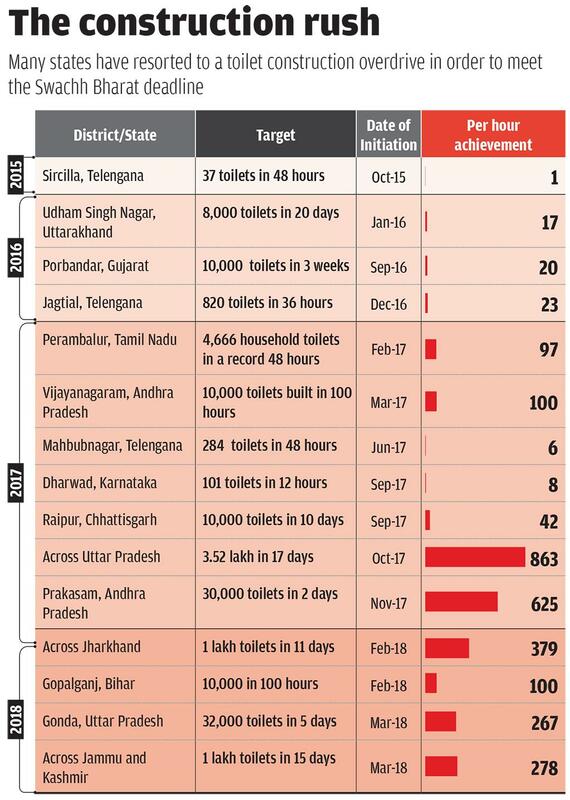 The rate peaked in 2017-18, where around 21 times more toilets were constructed compared to pre-SBM. But the manner in which the money of Information, Education and Communication (IEC) was spent differed according to district officials and the Ministry of Drinking Water and Sanitation (MDWS). The district had spent over I1 crore on IEC in the last two financial years, according to MDWS data of March 2018. The district officials say they had spent it on wall writings, hoardings and banners. This does not tally with the MDWS data of March 2018. According to MDWS data, the money was spent in “others” category, which was not explained. “Luckily the response received from residents was very positive due to IEC,” says Srivastava. People liked the idea of building toilets as there is barely any space available to defecate in the open. People, especially women, suffer massively due to this. They need to wait for long hours to relieve themselves. This often leads to a situation of shame and disgrace for them. “We have seen an exponential increase in toilet demand and huge number of applications,” adds Srivastava. But what demotivated the residents in the early phase of SBM was the cash flow. Hence, Mission 32 was launched where cash flow was made easy.